The village of Eyam is located some 9 miles south-east of Chapel-en-le-Frith and about the same from Sheffield, which lies to the north-east. Go to the centre of the village and find the church of St Lawrence standing beside the road to Foolow close to Eyam Hall and just west of the B6521 road to Sheffield. The Saxon cross stands in the churchyard. This very fine Anglo-Saxon (Mercian) cross stands 8 foot tall and dates from the 8th-9th centuries. It was apparently set up by missionaries from the north at Cross Low on the moors to the west of Eyam. Originally it was a wayside preaching cross that was 10 feet high and certainly must have looked very spectacular, but now it is only 8 feet high due to it being knocked about a bit in more recent times and losing one of its shaft sections. In the 18th century the cross was discovered beside a trackway on the moors, from whence it was brought to the churchyard of St Lawrence’s church; but then for a long time it stood abandoned and uncared for in the corner of the churchyard. Eventually it was restored and placed in the churchyard where it now stands proudly. The cross is said to be the only one of its type in the Midlands that retains its cross-head. It has some very rich decoration on the west face with fabulous interlacing scroll-work running up the shaft that is typically Mercian in origins. On the west-face, especially the upper section, there are human figures probably St Mary the Virgin with the baby Jesus, angels and Christ in glory, each in their own sections or panels. The cross is grade 1 listed. St Lawrence’s church houses a Saxon font. Rev. Arthur, C., Illustrated Notes on English Church History, Society for Promoting Christian Knowledge: London 1901. Rodgers, Frank, Curiosities of Derbyshire and the Peak District, Derbyshire Countryside Ltd 2000. 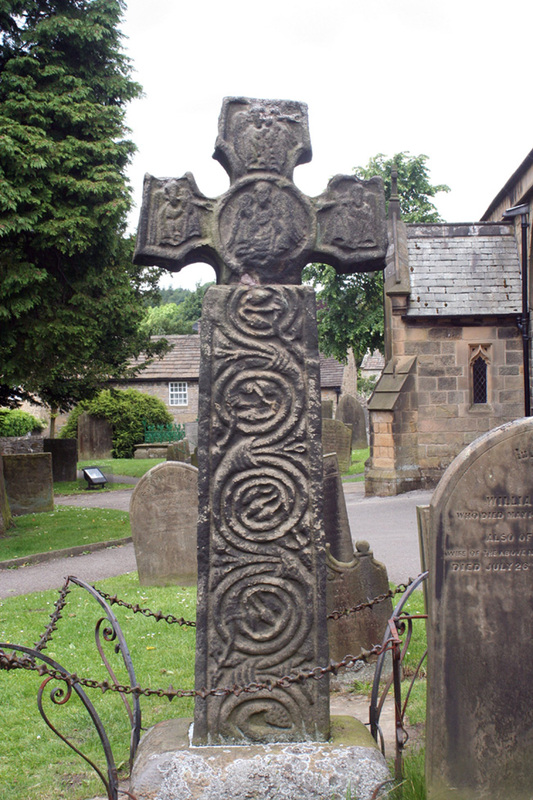 This entry was posted in Brigantia (Northern England), Crosses, Derbyshire and tagged antiquities, Archaeology, carvings, christianity, churches, Crosses, Derbyshire, english heritage, Eyam, folklore, Foolow, medieval history, plague stones, Saxons, spirals. Bookmark the permalink.